^ a b Coria R.A., Chiappe L.M. (2007). “Embryonic Skin From Late Cretaceous Sauropods (Dinosauria) of Auca Mahuevo, Patgonia, Argentina”. Journal of Paleontology 81 (6): 1528–1532. doi:10.1666/05-150.1. http://jpaleontol.geoscienceworld.org/cgi/content/abstract/81/6/1528. ^ a b c Tidwell, V., Carpenter, K. & Meyer, S. 2001. New Titanosauriform (Sauropoda) from the Poison Strip Member of the Cedar Mountain Formation (Lower Cretaceous), Utah. In: Mesozoic Vertebrate Life. D. H. Tanke & K. Carpenter (eds.). Indiana University Press, Eds. D.H. Tanke & K. Carpenter. Indiana University Press. 139-165. ^ Molnar R.E. and Salisbury S.W. (2005). “Observations on Cretaceous Sauropods from Australia”. In Carpenter, Kenneth and Tidswell, Virginia (ed.). Thunder Lizards: The Sauropodomorph Dinosaurs. Indiana University Press. pp. 454–465. ISBN 0-253-34542-1. ^ a b Weishampel, David B.; Dodson, Peter; Osmólska, Halszka, ed (2004). The Dinosauria, Second Edition. Berkeley: University of California Press. ISBN 0-520-24209-2. ^ Géraldine Garcia, Sauveur Amico, Francois Fournier, Eudes Thouand and Xavier Valentin (2010). “A new Titanosaur genus (Dinosauria, Sauropoda) from the Late Cretaceous of southern France and its paleobiogeographic implications”. Bulletin de la Societe Geologique de France 181 (3): 269–277. doi:10.2113/gssgfbull.181.3.269. http://bsgf.geoscienceworld.org/cgi/content/abstract/181/3/269. ^ Otero A., Reguero M. (2013). “Dinosaurs (Reptilia, Archosauria) at Museo de La Plata, Argentina: annotated catalogue of the type material and Antarctic specimens”. Palaeontologia Electronica 16 (1): 1–24. ^ Sallam, Hesham M., et al. (2018). “New Egyptian Sauropod Reveals Late Cretaceous Dinosaur Dispersal between Europe and Africa.”. Nature Ecology & Evolution 2 (3): 445–451. ^ Mannion P.D., Otero A. (2012). “A reappraisal of the Late Cretaceous Argentinean sauropod dinosaur Argyrosaurus superbus, with a description of a new titanosaur genus”. Journal of Vertebrate Paleontology 32 (3): 614–638. ^ Leonardo S. Filippi, Rodolfo A. García and Alberto C. Garrido (2011). “A new titanosaur sauropod dinosaur from the Upper Cretaceous of North Patagonia, Argentina”. Acta Palaeontologica Polonica 56 (3): 505–520. doi:10.4202/app.2010.0019. http://www.app.pan.pl/archive/published/app56/app20100019.pdf. ^ Coria, R. A.; Filippi, L. S.; Chiappe, L. M.; García, R.; Arcucci, A. B. (2013). “Overosaurus paradasorum gen. et sp. nov. , a new sauropod dinosaur (Titanosauria: Lithostrotia) from the Late Cretaceous of Neuquén, Patagonia, Argentina”. Zootaxa 3683 (4): 357. doi:10.11646/zootaxa.3683.4.2. ^ Calvo, J.O., Porfiri, J.D., González-Riga, B.J., and Kellner, A.W. (2007). 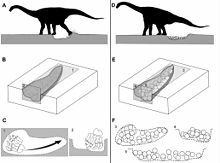 “A new Cretaceous terrestrial ecosystem from Gondwana with the description of a new sauropod dinosaur”. Anais Academia Brasileira Ciencia 79 (3): 529–541. doi:10.1590/S0001-37652007000300013. PMID 17768539.